It's hard not to fall in love with this couple's clean, clutter-free, and cosy Yishun flat. 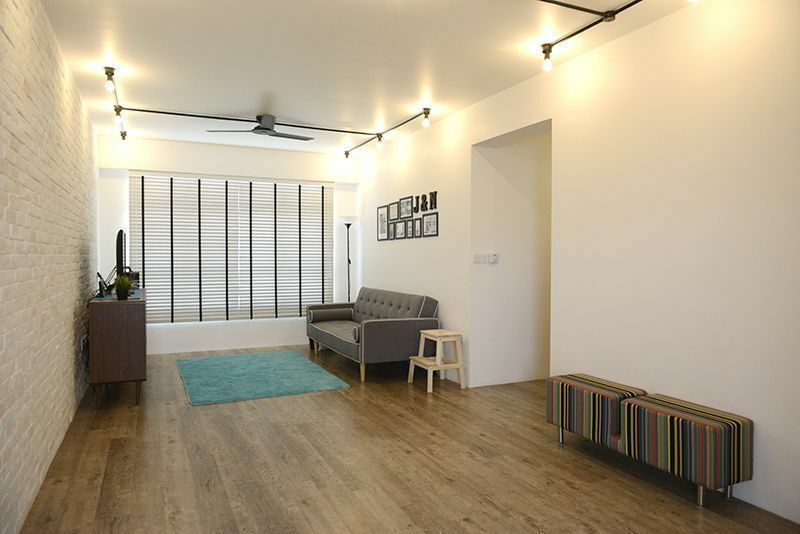 Upon stepping inside Jai and Noora's HDB flat in Yishun, you will first notice the space—precious space undeterred by the presence of a dining table or another piece of bulky furniture. The open layout is pleasing to the eyes, with the wood-plastic composite (WPC) flooring shining under the track lights. Then, your eyes will be directed to the living room flanked to the corner. Even the living room stands as a no-frills area as it only houses two major pieces: a midcentury buffet table converted into a TV console and a sofa bed. The step stool and the rectangular ottoman are just additional furniture pieces that neither obstruct the flow nor disrupt the area's minimalist feel. Here, in the living room, there is a sense of calm. A subtle warmth. Cosiness courtesy of intelligent space planning and the absolute absence of clutter. "It's industrial, Scandinavian, minimalist...with mid-century furniture," says Jai about their new home. "We didn't have an interior designer; it's all our style. However, we had a contractor who helped us out. There's a bit of DIY here as well." The couple collected the keys the day after getting married, and the subsequent months saw them embarking on an exhilarating renovating and decorating journey. Their number one goal? To create a bright and homey space just in time for the birth of their firstborn, Harriskander. Together, they brainstormed for decorating ideas, researched online, decided what to DIY or what to leave to the contractors. They considered each other's wants: Jai accommodated Noora's wish of a polka-dotted headboard, Noora happily allowed Jai to convert the other bedroom into his music room—"I'm in a band, so I've always wanted a personal jamming room since I was a kid," Jai says. They gave up their original idea of going for a totally Scandinavian or contemporary style, and went for industrial with a touch of Scandinavian and minimalist instead. There were little personal touches that they added, like the bamboo blinds that reminded Jai of his childhood in Seletar and photos of their wedding day. The home's overall style was a byproduct of a lot of inspirations and even aspirations borne from the couple's New York and European travels. "The houses, and the apartments we stayed in Western countries, we brought back some of the ideas from them like the brick wall," Jai says. The industrial style of this flat is largely attributed to the white brick wall and the exposed pipes and track lights on the ceiling—the wooden finish on the floor simply giving the space a warmer feel. When Jai and Noora got the flat, there was a hollow part in the middle of this wall, typical of any BTOs. They needed it to make it more level for a more natural and realistic look. "That thing cost us $900 to make it level. The brick wall cost us $4,800. This brick wall is one of the most expensive parts of this house. Had I known that making this brick wall wouldn't be that complicated, I would have done it myself," laughs Jai. The couple also got the contractor to take care of the flooring. "We've always wanted this kind of flooring. WPC is waterproof, and we have covered our living room with this...and it goes all the way to kitchen and service area." "We are a couple with a minimal budget. When we were looking at furniture, we realised that they were so pricey, and it would take a while before we get to buy them. We didn't want to take out renovation loans just to buy furniture. We were taking it slow. I like midmodern century furniture pieces, the ones with pencil legs. The ones I saw were really expensive. Luckily, I saw this buffet table from Hemma, and I bought it because it was on sale. It was only $599." "This sofa is a sofa bed, and we saw something like this that costs $1,000. We bought it for $299, and it looks okay. Here in our house, we want to change things every so often. We don't want to buy something expensive, [because by then we'd have to think] where to park it when we decide to buy something else. Two or three years down the road, we can change items without the pain." Raw concrete walls and laminate cabinets with a cement finish give this kitchen an industrial look. The Smeg '50s Style Refrigerator in Pastel Green, vintage tin cans, and cerulean plates keep it from looking too cold. The couple also opted for open kitchen shelves instead of cabinets. "We both went traveling, and we liked hanging out at cafes. Some of those cafes have these chalkboard walls, so we decided to bring the concept into our house. This is a sticker, so if we don't like it anymore, we can just peel it off," Jai says. Jai shares: "I'm in a band, so I've always wanted a personal jamming room since I was a kid. I just want that dream come true. So while my baby is not yet grown up, maybe I can use this room to make my personal practice space. I use acoustic foam to reduce the echo, and this also helps with the soundproofing. I made sound recordings here. Before when we were the only ones on this floor and the level below us was still unoccupied, we just played and played and took advantage of the situation." "Noora and I slowly did the nursery. Both of us would sit down and talk about it before the arrival of the baby. We got the Moses basket from Mothercare, and the wardrobe is from Ikea. The house is small, so we don't want a built-in wardrobe that would stay there permanently and become redundant. We want flexibility, we want to move things around. And it's not expensive at all. That shelf, the chest drawer...it's slightly less than $200. It's better than building a $1,000-worth wardrobe." "Noora is in love with polka dots. Our invitation wedding card had polka dots on it. When we first moved in, she was indirectly telling me that she would love polka dots in the bedroom. And I was like, 'Okay you look for the stickers and I fix them for you.' Even if I didn't have the proper materials to do the alignment, one night I just had the inspiration and I just did it. It's not expensive at all—the stickers were only $30 for 100 pieces." "Noora has always wanted to have a walk-in wardrobe, but she didn't want to sacrifice the other room. So we sat down and said, 'Maybe we can do an open concept wardrobe? A mini walk-in wardrobe?' So we got that fixed with the help of the contractor. It cost $800 to build the wall, the things inside cost about $300." "We got the contractor to do the laminate cabinets with concrete finishings. We wanted the drawers in the bathroom to have that industrial and raw look because if we wanted the industrial look, we needed to go all the way." The ensuite bathroom features a simple bathtub and shower curtains in Noora's favourite prints: polka dots. "When we came in, there were no doors in the bedroom, so we were planning to get doors. Then one day, I finished my shift and was about to go to the flat when I saw three doors downstairs. I was like, 'Should I pick it up?' It's not stealing. If they're still there the next morning, the doors are ours," says Jai. "So yes, we saved the cost of three doors. I picked them up myself." At first, when friends would tell Jai and Noora they're coming over, they would feel uneasy. "We didn't have that confidence because our house is not perfect," Jai says. Later, they realised that the beauty of their house is in its rawness—the unfinished look of the walls, the brick wall, the exposed pipes. "We have imperfection. Maybe the imperfection is the beauty," Jai concludes. Budget: About $25,000, all in all, inclusive of furniture. "We have an expensive fridge, so add that to the furniture plus the contractor which cost us $19,000 (with AC)." Just go with whatever you feel. "If you have an idea, just go with it. Keep looking for interior designers and contractors who will agree with your concept. It's because you want to come home to what you want. You want that full satisfaction that you're in charge of your home and you got what you want." Don't rush. "Take your time. Even if you have a huge budget, don't buy everything in one go. Maybe, you can fix the house first and [attend to] the basic things. Then, look around and check out blogs. For example, it took us six months to have a TV." Always be careful when dealing with contractors. "No matter how good the contractors are, never pay them 100 percent right away." Let them finish the task first before paying them in full. Weigh the pros and cons of doing DIY. "The advantage of DIY is you get to save. The disadvantage is you have to deal with the contractor if they screw up."